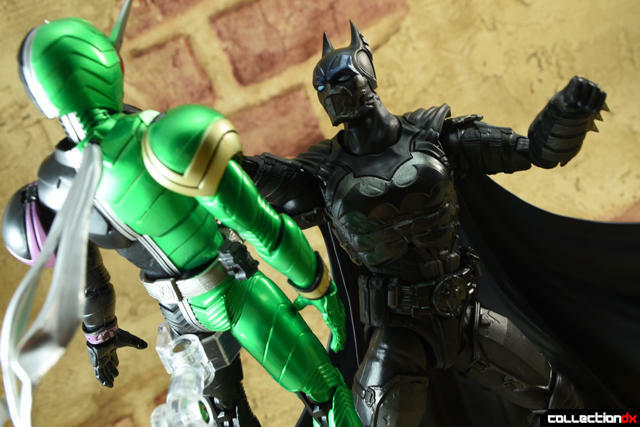 Batman fights crime on CDX thanks to Lunar Toy Store. Head over there to pick up your S.H. 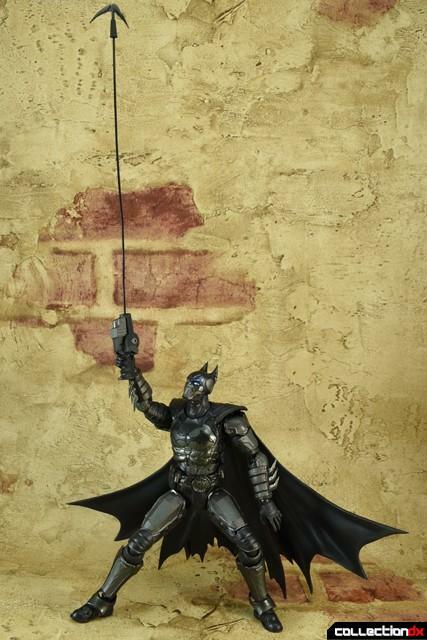 Figuarts Batman (Injustice Version). Batman is a character that needs little introduction, but I am going to do one just in case any of the readers out there have missed the Batman train completely. Currently, Batman is THE biggest superhero not owned by Disney. Batman’s story begins as that of Bruce Wayne, a young boy born into immense wealth. Unfortunately, money couldn’t stop his parents from getting shot in a dark alley. After seeing his parents murdered right before his eyes, Bruce Wayne decides to use his money and train his body to subdue the criminal element in Gotham City. The story of Batman began in the pages of Detective Comics, but has grown to cover just about every form of media out there. One of the more recent media outings of the Dark Knight pitted a well-rounded roster of the DC superheroes against the cast of the ultra-violent Mortal Kombat. This video game by NetherRealm Studios was titled DC vs. Mortal Kombat. It was later followed up by Injustice: Gods Among Us, which removed the Mortal Kombat element in favor a bigger cast of DC characters. 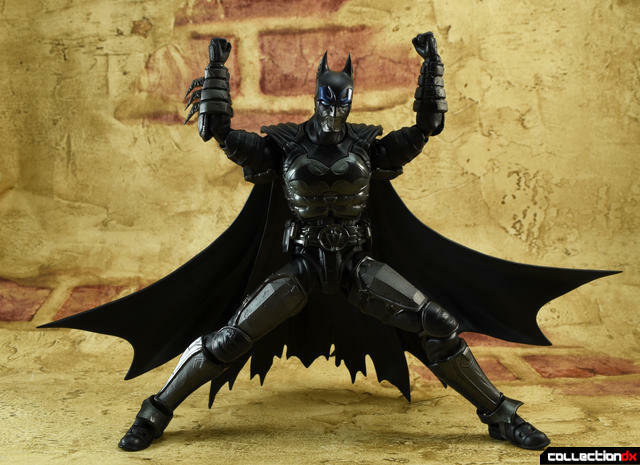 Besides being featured in all sorts of watchable and playable visual media, Batman has also seen more than his fair share of toys gracing the toy aisles of stores everywhere. 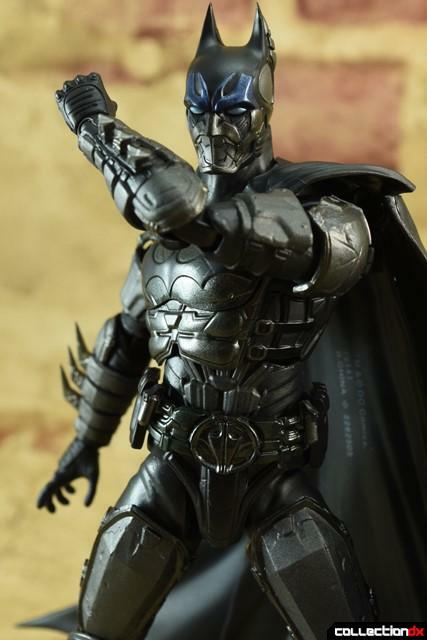 Bandai has decided to throw their hat into the vast batman ring by producing an S.H. 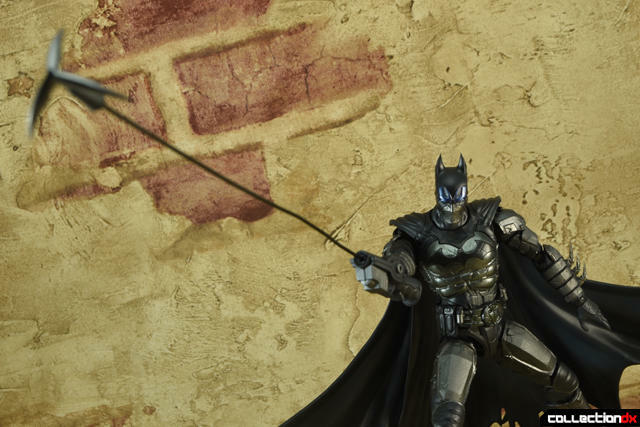 Figuarts of the Dark Knight as he appears in the Injustice video game, well one of his costumes in that game anyways. 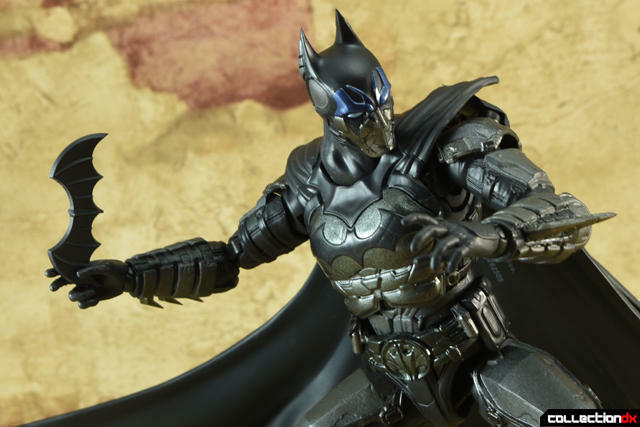 Bandai based their Injustice Batman on the Insurgency costume, it is an outfit that features a heavily-armored suit that is very reminiscent of the New 52 design. Bandai does a pretty good job with the sculpting of this figure. I remember seeing the unpainted prototype of this and thinking how nice it looked. Bandai did, however, skimp a bit on the paint applications for this toy. The belt should have had some yellow on the buckle and some of the pouches. 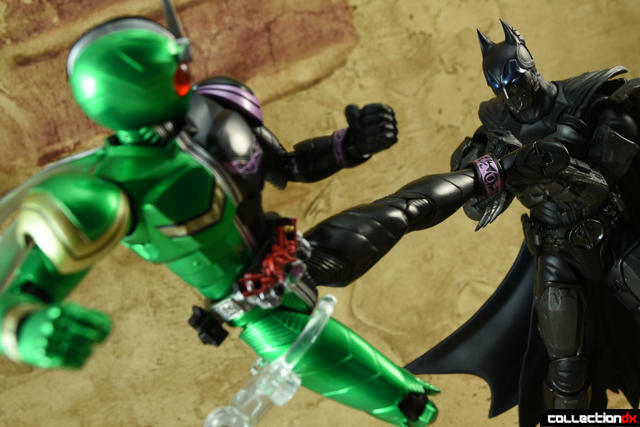 Instead, we get a belt that is colored in in mostly black, with a touch of green mixed in, and grey.Minor paint oversights aside, Bandai have done a great job at recreating the Insurgency Batman’s look. Even the oddly-designed face is faithfully recreated by Bandai. 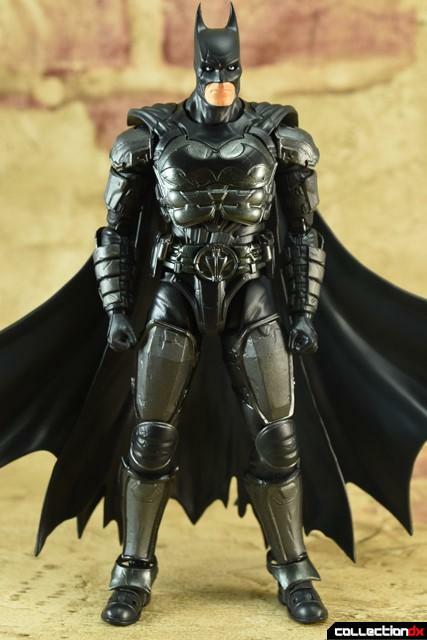 Since Batman looks goofy in the game, you can’t really blame Bandai for the fact the face sculpt is not the best looking. 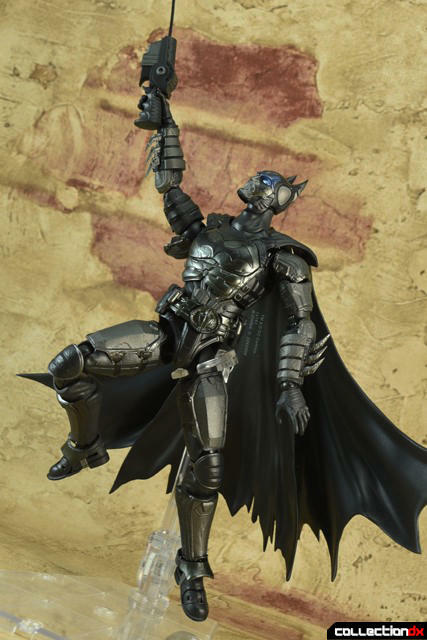 However, Bandai have included a second head for the Dark Knight, which is their own design. It looks a ton better and just goes to prove that Bandai was aware of the shortcomings of how the face was designed in the video game. 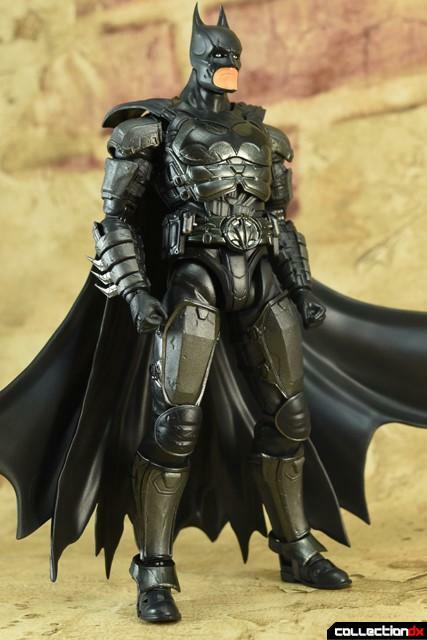 So from here on, you won’t see the normal head in the review much.The combination of the iconic batman cowl with the futuristic techy look is the kind of face that would definitely instill fear into the hearts of the criminals in Gotham City. The S.H. 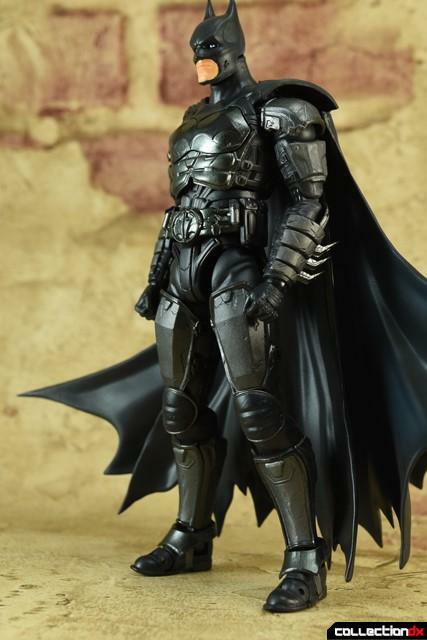 Figuarts Batman features a three-piece cape. Each side pieces features two hinges on the arm that connects to center piece. Meaning that you get a lot of nice movement from the cape, which allows you to pose it very dramatically. 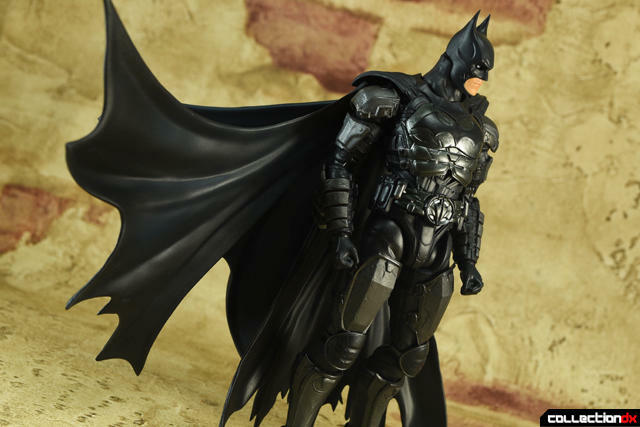 The middle part of the cape has a peg on it that attaches to a hole in the upper back of Batman’s body. 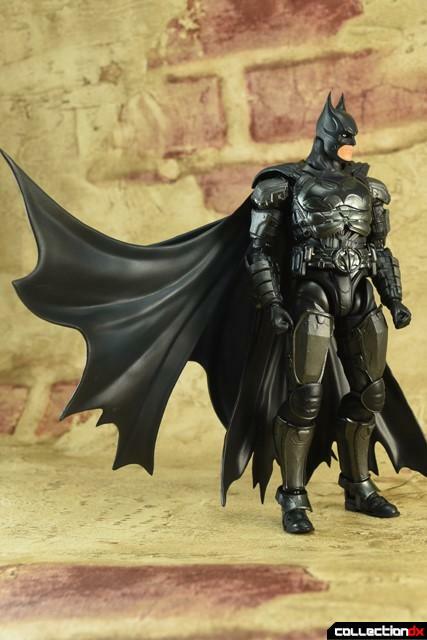 Above the hole is the rest of Batman’s cape, which is permanently attached to the figure. 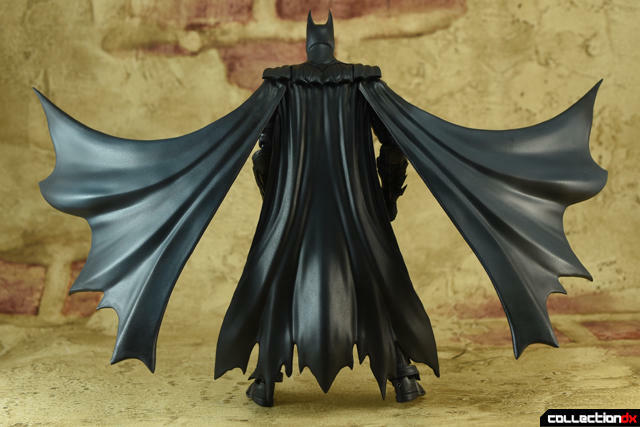 Since the most of the cape comes unassembled and removed from Batman’s body, you may run into one of the piece falling off or the whole thing coming off Batman’s back. These are rather rare occurrences and can be easily overlooked, since it is fairly easy to put the cape back on Batman. As we all know, Batman needs some weponry so that he can better dish out justice. This release comes with a couple. First, the S.H. 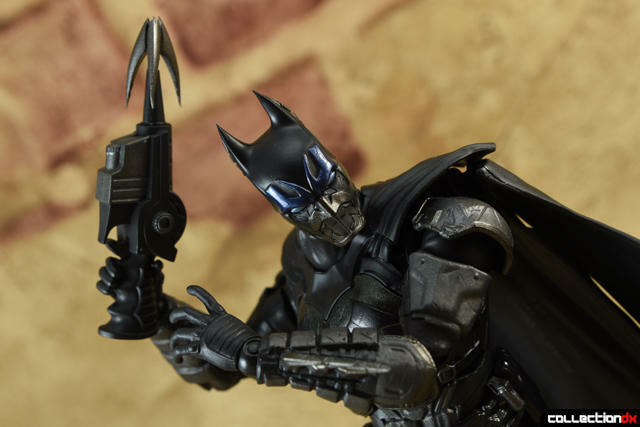 Figuarts Batman comes with two Batarangs. He also comes with a grapple gun. The gun has a second piece that can be attached to the end, to showcase the extended line. The line appears to be made of wire covered in plastic. 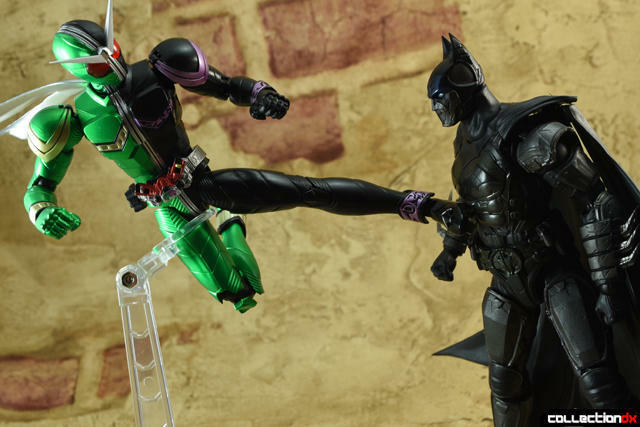 Articulation for Batman is pretty good. He features all of the staples of the S.H. Figuarts line and more. The upper body has bicep swivels, ball swivels, double-jointed elbows, double jointed neck, hinged shoulder pads and an abs crunch. This allows even such a heavily-clad Batman to move pretty darn well. The lower body features thigh swivels, ball joints in the thigh and ankles, double jointed knees and a toe hinge. Like I said, if it is a signature joint of the S.H. 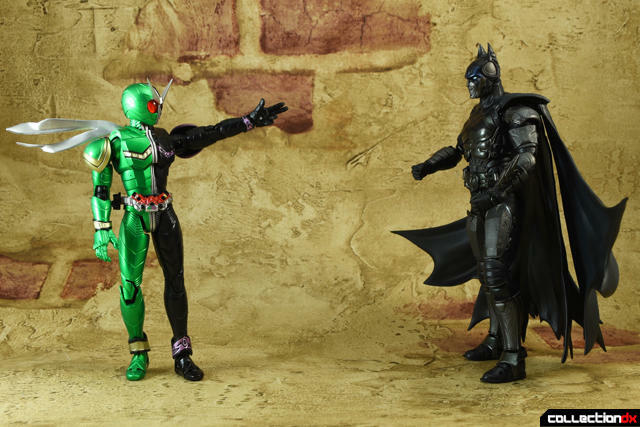 Figuarts line, it is on this figure. 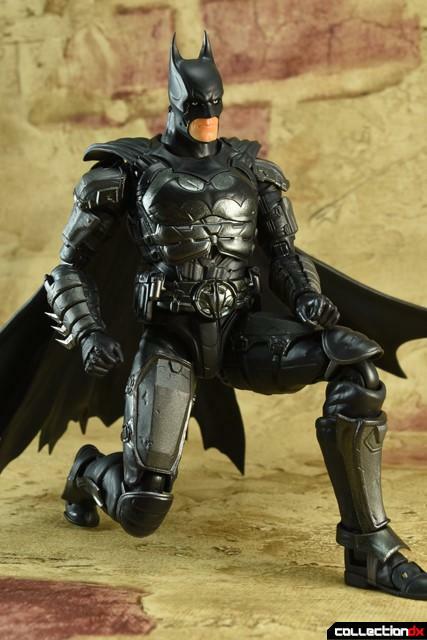 Batman can take a decent knee. Oh wow. Is that the best you’ve got? I don’t even have to block such weak attacks. Now tell me: Where is she?! Where did you hide her!? No wonder people call you a half-boiled detective. All in all, the S.H. 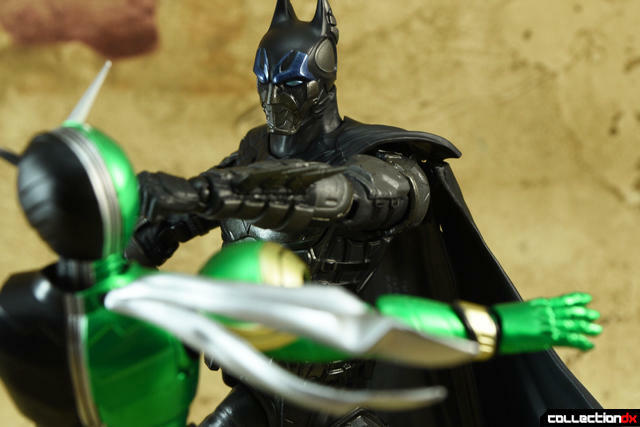 Figuarts is a pretty darn good Batman toy. It's got a good amount of poseability despite the contraints of the costumes desing and the plastic cape. The face from the video game may be a turn off for some, but Bandai hedged against this possible backlash by including that second, very cool looking head for this release. This release isn't super-expensive like the Hot Toys releases and it isn't as cheap as something that you can get at your local Wal-Mart. Being in a midpoint price range, the S.H. 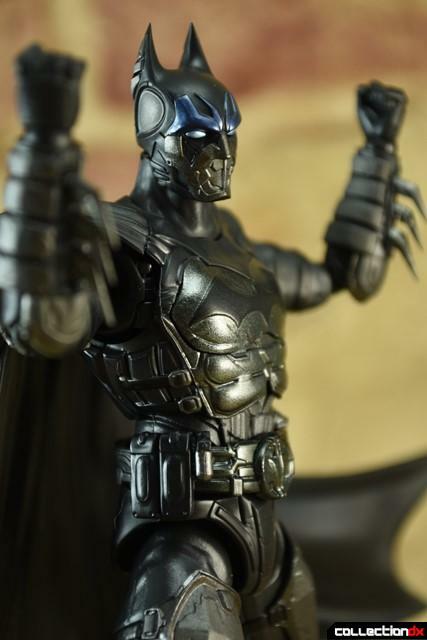 Figuarts Batman does a great job at providing a toy that provides good bang for the buck and looks good ( once you switch out the heads).